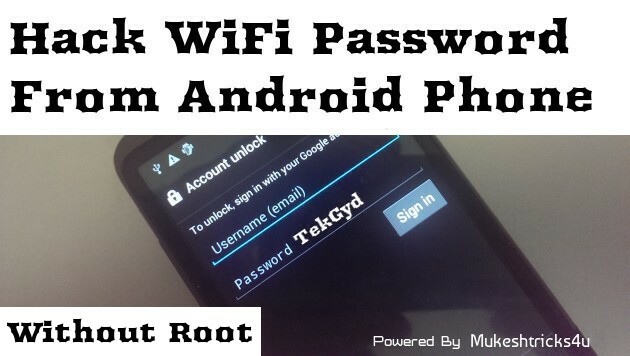 WiFi Password Hacking From Android is very simple and easy trick but it become easy when your Android Phone Is Rooted. But today itechhacks Presents brand new Trick To Hack WiFi Password From Android without rooting 2019. So dont be scare if your android phone is root or not this trick must be usefull for both. Why WiFi Hacking From Android Phone?. The answer of this question is, we all want to access free wifi in our colleges, society, and in cities. So why i posting this Hack? Because you all dont believe that my all reader send me 20-50 Message daily on facebook or on Gmail, thats why here i am posting this WiFi Hacking trick that is How to hack wifi password from android WITHOUT ROOT. everyone dont have Rooted Android Phone thats why i post this article for those who dont have Rooted Android phone. So here our first android app to hack wifi password using android without root. this hackinp app is spam free and easy to use.But Condition is that this App only hack only WPS & WPA routers . it will never Hack WPA2 Router to hack password. Conditions – It only support Latest Version of Android, Android 5.O & Marshmallow. Keep in mind your Android Phone must be Updated. #Steps To Hack WiFi Password From Android Without ROOT. #1. Start WPS/WPA TESTER App and Press on the Refresh Button. If this app shows green icon on your wifi name, that means this app can hack wifi password.if it shows red icon then it means the wifi is protected and you wont hack that wifi network. Select Green Signal WiFi. #2. Tap on connect automatic pin, I jus pray if are lucky to connect with wifi network. and this app can Hack WiFi Password Just in few Seconds. #3. Boom !! You Easily Hack Wifi Password from android phone without rooting your phone. Wifi Hacking Is In Process..
After our first Method, Here we have another Method To Hack WiFI Password From Android WITHOUT ROOT. AndroDumper WPS Connect Is another android hacking app 2016, which heps you to hack wifi passwords from android without rooting your device. Advantage – The Main advantage of this app is This app will try to connect WPS Connection also, this app may or may not connect WPA2 Network, But this app try to connect WPS enabled Wifi routers that have vulnerability using some algorithm to connect the wifi. #1. Rooted Android Phones + Supports All Versions of Android if device is rooted. Steps Keep In Mind During Hacking Of Wifi Password From Android . #1. if your android phone is not rooted or your android version is lollipop 5.O or above then this app only connect you with network. in simple words it dont able to show you Password of wifi. if you already know the WPS PIN you can use the app to connect and get the password using your PIN. So Above Is all About How To Hack Wifi Password from Android without root. i think its very useful for all of you. iTechhacks Here is not take any responsibility of bad usage of This Hack. this is the first post on Hack WiFi Password From Android (Without ROOT) 2019.Hope you all like this post. If Then there you need any help Must Comment Below Or Message Us Freely.This is first post by itechhacks.com.Stay connected with us! However I am having difficulties with your RSS. I ԁon’t understand why I am unable to subscribｅ to it. problems? Anybody wһo knows the answer will you kindlу respond?